Outcry has been building over the rising cost of brand-name medications, but the price of generic drugs has been moving in the opposite direction. The stock prices of generic manufacturers have tumbled, but many consumers aren’t paying less at the pharmacy counter. Not all drug prices are going up. Amid the public fury over the escalating costs of brand-name medications, the prices of generic drugs have been falling, raising fears about the profitability of major generic manufacturers. Last week, Teva Pharmaceuticals reported that it had missed analysts’ earnings estimates in the second quarter and planned to lay off 7,000 workers. Its share price plummeted 24 percent in one day as investors worried there was no end in sight. Share prices of other generic drugmakers also declined, as did those of wholesalers, which profit from the sales of generic drugs and have said they expect prices to continue declining. Mylan, another large generic drugmaker, will report its second-quarter earnings on Wednesday. Mylan also sells the EpiPen, the brand-name allergy treatment whose price increases have stoked outrage over the past year, but the company’s primary business is as a seller of generic drugs. This may seem like good news for consumers, but it’s unclear how much they will save. Why are generic prices falling? Generic drugs are copycat versions of brand-name products and — to a point — their prices are expected to drop over time. When a brand-name drug first loses its patent protection, prices fall slowly. Over the next couple of years, as more competitors enter the market, the prices drop even more, until the pills become commodities and sell for pennies. Blockbuster drugs that have recently taken this path include Lipitor and Plavix, the cholesterol-lowering and blood-thinning pills that now cost as little as $10 for a monthly prescription. Generic drug prices have been declining in the United States since at least 2010, according to a August 2016 report by the Government Accountability Office. They have fallen even in the face of high-profile exceptions: Dozens of old generic drugs have risen in price in recent years, for reasons that include supply disruptions and competitors’ leaving the market. For example, the price that pharmacies paid for the antibiotic doxycycline hyclate increased to $3.65 a pill in 2013 from 5.6 cents in 2012, according to an analysis of pricing data by Adam J. Fein, president of Pembroke Consulting, who researches the drug-distribution industry. The spike in prices of doxycycline and other generic drugs led to a congressional investigation as well as state and federal inquiries into price-fixing that are still underway. A coalition of state attorneys general have accused a number of companies of colluding to keep prices high. Fein said the price of doxycycline has since declined to 60 cents a pill. “That’s a big switch,” he said. Despite these cases, the trend toward deflating generic prices appears to have accelerated as companies have more aggressively undercut each other’s prices. Making matters worse for the generics companies, they are missing out on peak profit potential because not as many brand-name products are losing patent protection. The six-month period after a drug goes generic is typically the most lucrative time for the first company to market. And the Food and Drug Administration has been clearing out a backlog of generic-drug approvals, meaning more competitors are now entering markets for certain drugs. In a recent call with Wall Street analysts, George S. Barrett, the chairman and chief executive of Cardinal Health, a major drug distributor that reported declining profits last week, said generic deflation was not new, but that the company historically had been able to anticipate it. “It just looked a little different than we had seen,” he said. In recent years, generic companies have gone on acquisition sprees in an effort to head off some of these challenges. But they have been outmaneuvered by those who buy their products, a trend that has been intensifying. Major pharmacy chains, drug wholesalers and pharmacy benefit managers (which operate drug plans for insurers) have united into colossal buying groups. For example, Express Scripts, a large pharmacy benefit manager that runs its own mail-order pharmacy, teamed up with Walgreens Boots Alliance in May to purchase generics. “What we’re seeing is incredible competition — and we’re causing it,” said Dr. Steve Miller, the chief medical officer for Express Scripts. So are consumers saving any money? The declining prices are broadly beneficial to the health care system, and may put some slight brake on rising premiums. But most of those with health insurance pay a fixed co-payment — $10, for example — for each generic prescription, and therefore don’t pay more or less, regardless of any fluctuation in the actual price. And even those who do pay cash for generics may not notice a drop in price because many generics are already cheap. But that figure hides vast variations. 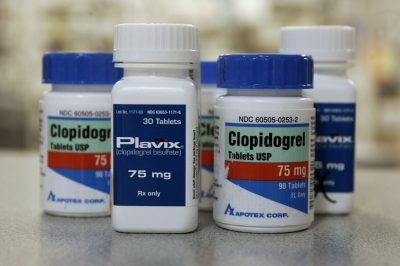 The retail price for clopidogrel, the generic for Plavix, dropped 37 percent, to $3.77 from $6.03 a pill, GoodRx found. Conversely, the blood pressure drug metoprolol went up about 70 percent, to 59 cents a pill from 35 cents. But GoodRx noted that consumers can almost always do better than paying the retail price, or sometimes even their co-payments, using websites — like its own — that offer discounts. Does this mean the problem with high drug costs has eased? Overall drug spending is still on the rise because of the skyrocketing price of new, brand-name drugs. For example, a report by QuintilesIMS, an industry research firm, found that in 2016, drug spending increased by nearly 5 percent, after accounting for discounts and rebates paid by manufacturers. Generic drugs accounted for 89 percent of prescriptions dispensed in 2016, but only 26 percent of the costs, according to QuintilesIMS. Each year, generic drugs make up a larger share of the prescriptions filled, while accounting for a smaller portion of drug costs, said Chester Davis Jr., the president of the Association for Accessible Medicines, the generic industry trade group. New treatments for conditions like cancer and multiple sclerosis often enter the market with annual price tags in the tens of thousands — and sometimes hundreds of thousands — of dollars. Many manufacturers also raise the price once or twice a year, compounding the problem. Is this trend likely to continue? Generic manufacturers say they expect it will, and are worried that lower prices could put pressure on profits and threaten the viability of the companies. This could lead to a wave of mergers and acquisitions, reducing competition and leading to higher prices. David Maris, an analyst for Wells Fargo, dismissed the idea that companies would go out of business. “Right now we have a very healthy generic market,” he said. The new commissioner of the Food and Drug Administration, Dr. Scott Gottlieb, has made increased competition in the drug market a key part of his policy platform. He said he wanted to make it easier for generics manufacturers to get clearance for hard-to-copy products like eye drops, topical creams and asthma inhalers. And he wants to reduce barriers to ensure new players can enter the market for existing generic drugs, possibly lowering prices further. “We’re looking to create competition where there isn’t competition,” he said.